That's good news if you like rhubardb (like me); but that's bad news if you don't like it that much (like my dad) or not at all (like my husband's maternal grand-mother). I found out that she did not like rhubarb one day we had her over back then, when we were still living in France. My husband had bought (bought? Yes, I know, we could have made it!) a superb tarte à la rhubarbe for dessert. His grand-mother has always been a really good eater (to say the least) and he thought that offering her a good tarte for dessert would make her whole dinner at our place a memorable experience (sweet, no?). Memorable it was. For us (unfortunately, she does not remember this dinner). As we started bringing the tarte and she discovered that it was indeed with rhubarb, she took a bite and said "moi, je n'aime pas trop la rhubarbe", which is a nice way to say that she did not like it at all! Yet, somehow, she managed to finish her slice. I can still hear her voice and whenever my husband and I are purchasing rhubarb, we joke about this dinner! Rhubarb is not always available (at affordable prices, that is) around us... so when we find some that looks nice and fresh (it has to be firm, not soft), we purchase 2 or 3 stalks to make apple sauce. I have also found it frozen next to the frozen berries. Because it can be very "tart", I have come to use it together with strawberries or, when not in season, bananas. Bananas and/or strawberries together with apples (and sugar) tone down the tart flavor of rhubarb, making it "eatable" to more delicate palates like my children'. They both like rhubarb-apple sauce and I serve it to them over plain yogurt. If they want, we add a few nuts on tops (walnuts, hazelnuts or sunflower seeds). It makes a perfect easy-to-make healthy dessert. Bon Appétit! In a pot, over slow heat, put the butter, the apples, the rhubarb and the sugar together. Cover and cook for about 20 minutes until fully cooked. I find that rhubarb stalks are easier to blend if I peel them a little bit. I use a vegetables peeler and peel the stalks before cutting them. You take out a few long threads of rhubarb. I find 1/2 price apples at the farmers' market. I purchase them for apple sauce. I try to avoid the Granny Smith because they are too tart. 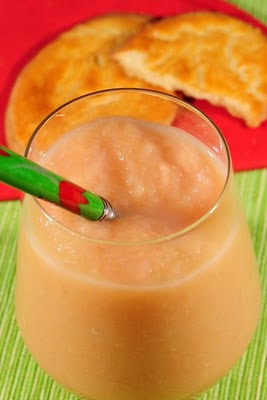 Good apples for apple sauce are JonaGold, Golden, Gala. If you are making it for children older than 12 months, you could sweeten it with honey. I don't like it cold; I generally heat it up a little bit in the microwave before serving. Rhubarb is said to have laxatives effects. On vient de faire une compote pomme rhubarbe car en ce moment, c'est la saison de la rhubarbe en Alsace (mois de mai). Dans les pâtisseries, il y a de nombreuses tartes à la rhubarbe meringuées...C'est excellent ! Mais comme les Alsaciens ont toujours le mot pour rire, certains collègues de Matthieu pensait que la rhubarbe ne poussait qu'en Alsace!! !